Hungerford Crewe, later 3rd Baron Crewe, was the third child, and second surviving child, of John Crewe, 2nd Baron Crewe and Henrietta Maria Ann Hungerford. He was educated at Eton College and Oxford University and was elected a member of the Society of Antiquaries in 1840 and a member of the Royal Society the following year. Following his father’s death in 1835, Hungerford Crewe inherited the complete Crewe estate, including Crewe Hall in Cheshire and several large estates in Staffordshire and Leicestershire. During his lifetime Hungerford renovated the Jacobean mansion Crewe Hall and installed a heating system. He was renowned for being a good landlord to his various tenants and exceeded the legal compensation requirement for his tenant famers affected by the cattle plague of 1866. Hungerford Crewe never married and died of influenza in 1894. Little is known about the early life of Anthony Stewart other than that he was born in Perthshire and worked under the Scottish portrait and landscape painter Alexander Nasmyth. In 1793 Stewart married the daughter of Alexander Weir, Janet Weir of Tron, in Edinburgh and the couple relocated to London after Stewart became an established painter, exhibiting at the Royal Academy between 1807 and 1820. The couple had two daughters, Grace and Margaret, both of whom went on to become successful miniaturists. 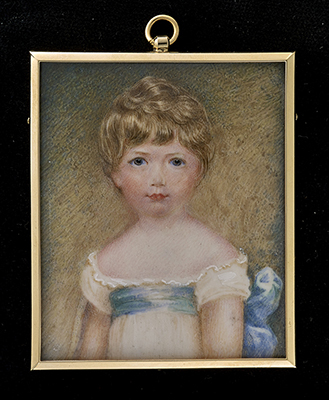 Stewart became acquainted with the royal family and painted miniatures of both Queen Victoria as a child and Princess Charlotte. As can be seen here, Stewart excelled in painting children, with miniatures of the Dalrymple and Fanshawe families in the Scottish National Portrait Gallery and examples of his work in the Royal Collection. He died on 20th November 1846 in Norwood in Surrey.